A friend asked me if I would help him fish for sockeye salmon. “Meet me at 7:00AM at the pavillion and wear your rain gear,” he said. We had sunny skies and 75-80 degree weather every day we were in Alaska. Yeah sure, bring rain gear! Purse seine net fishing is done with three boats. The lead boat is tied parallel to another boat that has no motor. The lead boat is in command and circles slowly around the bay looking for salmon (they jump out of the water frequently enough that you mostly have to wait and hope you are in the right position). The working boat tied to it has the nets and is where the work is done. 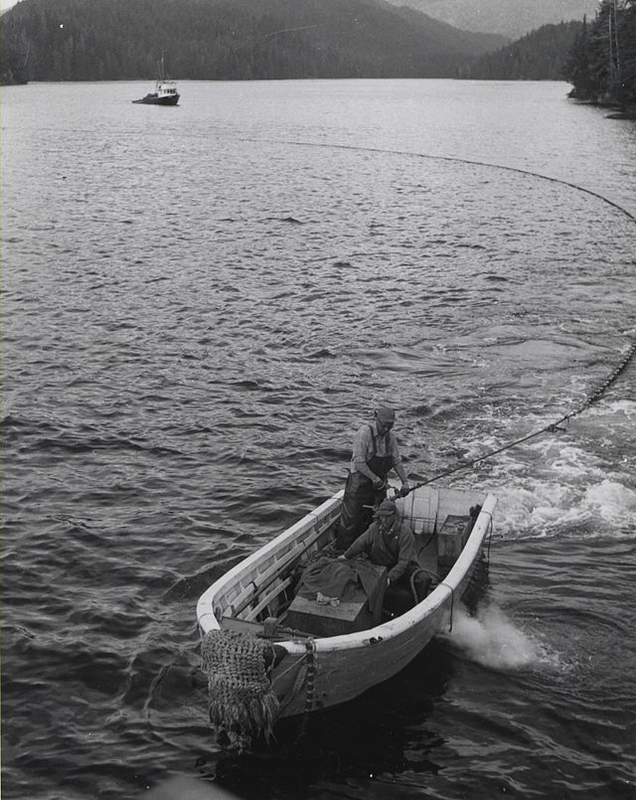 A third boat is held by hand to the stern of the working boat and is tied to the aft of the net. When you see fish jump near you the idea is to release the third boat and move away from each other with the net dropping into the water. 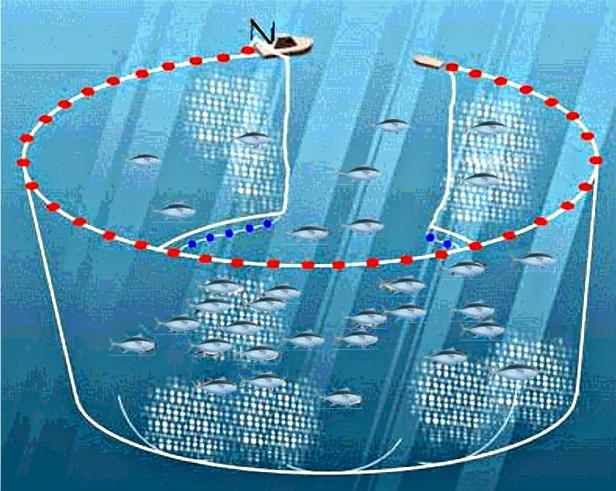 The net circles the school of fish and meets the working boat and purses the bottom of the net. Then you haul in the catch. It takes a team of people working together to pull it off. There are two boat drivers, a cork tender (topside of net), a purse tender (bottom of net) and a plunger. Being the rookie, I got the job of plunger. Oh yeah… the rain gear. You see the plunger’s job is to make noise at the opening where the net is closing. Think of a toilet plunger made of aluminum and 20 feet long. My job was to pop the plunger at the top of the water as fast as I could for about 4 pops and then to plunge it as deep as it would go. It creates the illusion of seals feeding on salmon, so the fish move away from the hole and into the net. “If you are any good at it, we will all be soaking wet,” said the cork tender. Once you finally meet and purse the net you all help with hauling. Each time you do this it is called a set. It is exhausting. You do about one set every 40 minutes or so on a normal day. I was doing something right, because after each set we were soaking wet. Our first set was in response to a jump that was about 15 feet off the starboard bow. When you get going, it is fast and furious. To think, this was done with rowing just a few decades ago! We circled the fish and there was another jump – a good sign that we had circled the school. When we were finally turning towards each other to close the net, the plunging begins. Pop, pop, pop, pop, plunge as fast as possible (my back, neck, shoulders and arms will be sore for another week). It is not as easy as it sounds and you cannot let up. There’s commotion and calling back and forth and noise and water raining on us and then we finally pursed the net and began to haul it in. Jelly rain is the term for the jellyfish that are flinging off the net and into the air and all over us as we furiously pull up the net. At some point, the corks begin to bob wildly and you begin to see shimmers and flashes as the fish are visible. We did something right on that first set because we caught the whole school. My friend, gracious man that he is, gave me half the catch. So I was able to bring one sockeye back to camp with me. Yep – it was a school of two! We continued all morning and into the afternoon and had water haul after water haul – that is what you call an empty net. When we finished for the day they all agreed to come back at 7:00PM to catch the evening tide change and work into the night (I had to return to the team in Coffman Cove, so I couldn’t join them again). This is the kind of fishing that Peter, Andrew, James and John did in the Sea of Galilee when Jesus called them to be fishers of men. They had their share of water hauls (everyone does). It was a real honor to be able to join my friend and the others in working for a catch. This is a way of life in the subsistence communities of Alaska. I was thoroughly relating to the fishing stories of the Gospels. This kind of fishing takes teamwork. It is no wonder Jesus would choose such men. They were used to hard work, long hours, disappointments and perseverance. They were willing to work through the night. They knew what it meant to coordinate their collective effort towards the catch. I have been thinking about that ever since. So many illustrations! Over the past weeks in Alaska, our teams were able to harvest 43 cases of sea asparagus and deliver them to the villages. Then we turned to fish harvesting. We caught 45 coho, 15 halibut (including a 5’11″ 188 pounder) and 1 sockeye. We cleaned, filleted, canned, freeze-wrapped and/or smoked fish as is done in Alaska and then we delivered it to the villages. We split several cords of firewood and stained all the rails and decks at Joel and Trish’s home. We delivered the medical equipment needed for the dental team that departs for Prince of Wales on Saturday. We had devotionals every night together. Mission is a unique opportunity to live completely as a Kingdom family. And so we did. And so we do.